A Virginia soldier writes from "Camp Sunday", so named in honor of the day of the week that the battle of First Bull Run was fought, 4pp. 4to., written by "Edward" of Amherst County, Virginia, Fairfax Co., Va., Aug. 1, 1861. 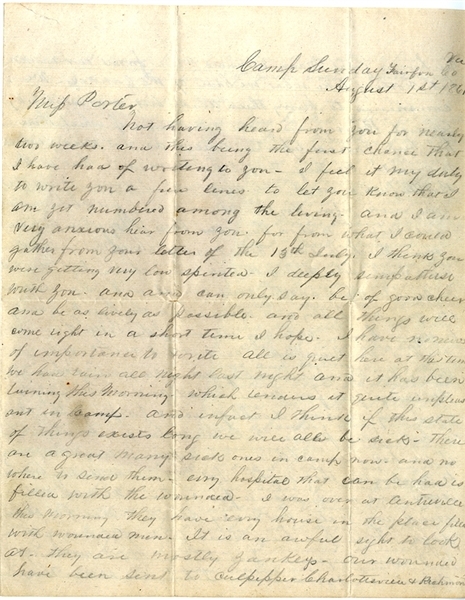 Most likely a member of Stonewall Jackson's brigade, Edward writes to Miss. Jones of Pedlar Mills, Amherst Co. Virginia, reading, in part: "…all is quiet here at this time…there are a great many sick…in camp…every hospital that can be had is filled with the wounded…at Centerville…every house [is] filled with wounded men. It is an awful sight to look at. They are mostly Yankeys. Our wounded have been sent to Culpeper, Charlottesville & Richmond. We have a great many wounded men our ranks, but nothing like what we have of the Yankeys. We commenced to bury their dead but were stopped by General Beauregard from some cause…the battlefield is covered with dead men…it will be some weeks before they return again…we will be ready to show them a bold fight when they do come…I would rather they would not come at all…they will be sure to make another trial and it will be a desperate one and it they are again whipped they will be willing to stay at home…we were exposed to the enemy's fire for seven hours and it was a very warm day…we double quicked for five miles at one beat from Prince William to Fairfax County and if we had been able we would have followed the Yankeys to Washington, but we completely broken down and nearly starved for water. We did not drink any water but muddy creek water for three days…tell Mr. Jones if he is drafted he had better get a substitute for he could not stand it a month…everything that I eat makes me sick and in fact I do not feel like eating at any time fried or boiled bacon and strong coffee would kill a elephant…we cannot buy vegetables at any price. The Yankeys destroyed all of the gardens in this county and they tore down all of the fences and turned the cattle in the cornfields…they cut down the corn as they went and destroyed everything…but we paid them back…net time they come we will get full pay…our troops are advancing on toward Washington. I do not know when we will attack it, but I hope before August is out. If I can see that place…completely broken up then I will be willing to return home and stay in peace, but unless it is done we will not have peace…it is useless to try to cure the disease unless we remove the cause. Tell Miss. Ellen I will bring her a Yankey trophy when I come. I did not get it from a dead Yankey…I took it from a live one or at least he was alive when I left him, but…was in rather a bad way when I last saw him…this is the first paper I have had for a week and walked two miles through through the rain to get this…we are not allowed to have our knapsacks-they are at the Junction and it makes everything very inconvenient…we will be ordered to Washington and we could not carry them. Yours until death, Edward." Also included is the original rare Confederate mailed Fairfax Court House transmittal cover with manuscript "Pd. 5" postmark. Near fine.